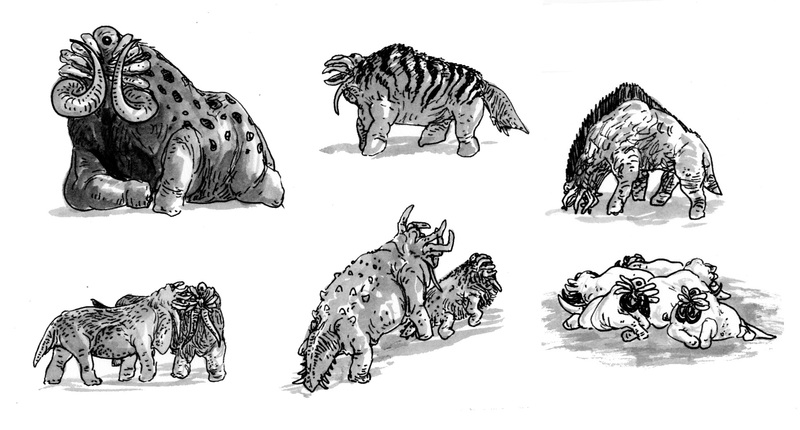 Starruses and their relatives are often called the mammals of Ilion, but beneath their hair and skin, they are very different from us. 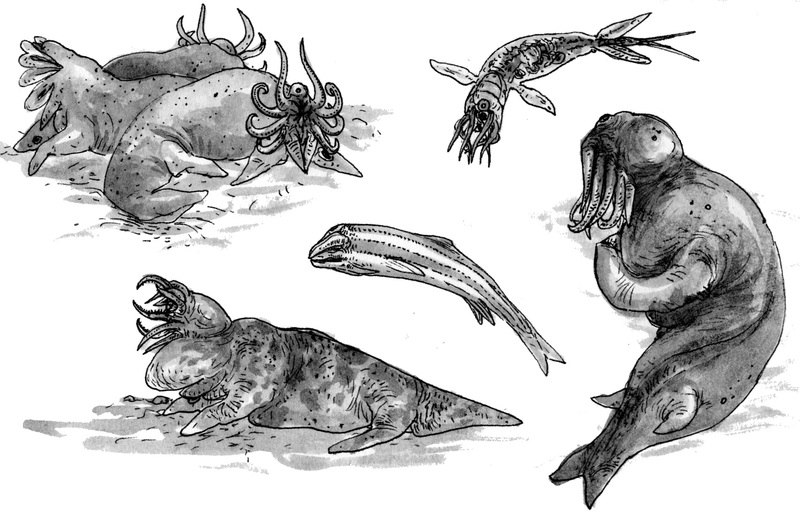 Anatomy – Starruses have four legs or flippers and a tail derived from two pairs of fused limbs. Arranged around the face are ten grasping mouthparts, or palps, which contain sensory organs for hearing, touch, and electricity (in some species). A single eye connects directly to the brain, which is encased in a fibrous basket-like skull. They ingest food with an eversible grinding stomach, which leads to the glandular stomach, the spiral intestine, and finally the colon. The spiral intestine wraps around a special organ (labeled “liver”) for metabolizing absorbed nutrients and releasing the products into the bloodstream. This organ also releases digestive enzymes into the stomach and intestine. Like all descendants of the hairy grubs (vermovillosids), they are capable of growing a rough, shaggy fur coat, ideal for cold environments. Tuning forks – The tuning forks are a bizarre, highly derived clade of coastal bottom-dwellers. While most starruses have poor vision, these animals are completely blind in the visible and infrared spectra. 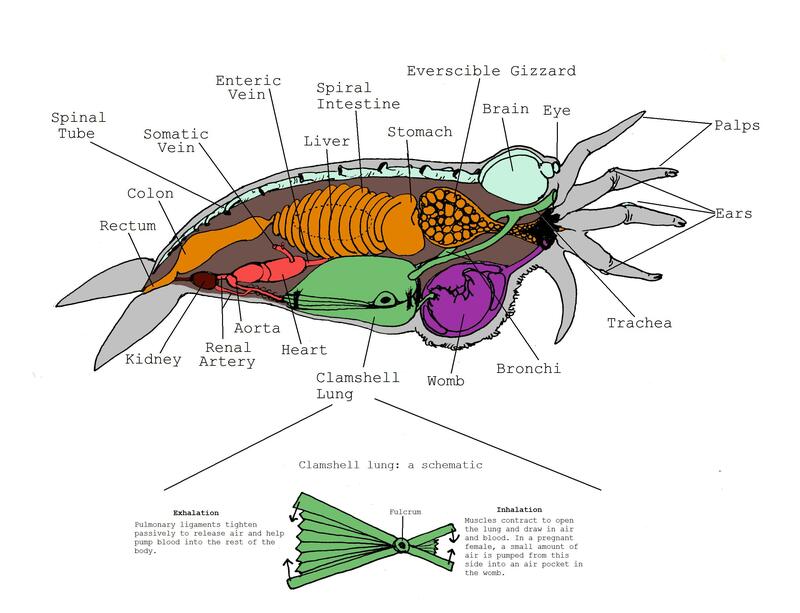 What at first appears to be an eye is actually the respiratory spiracle that migrated dorsally to function as a blowhole. The real eye is hidden under a pair of vestigial palps. The animal relies on electrical sensors in two specialized mouthparts to locate small fish. A quick shock immobilizes the prey. Unfortunately, this attack consumes energy and temporarily blinds the animal of its most reliable sense, leaving it vulnerable to higher order predators. A tuning fork must strike with precision. 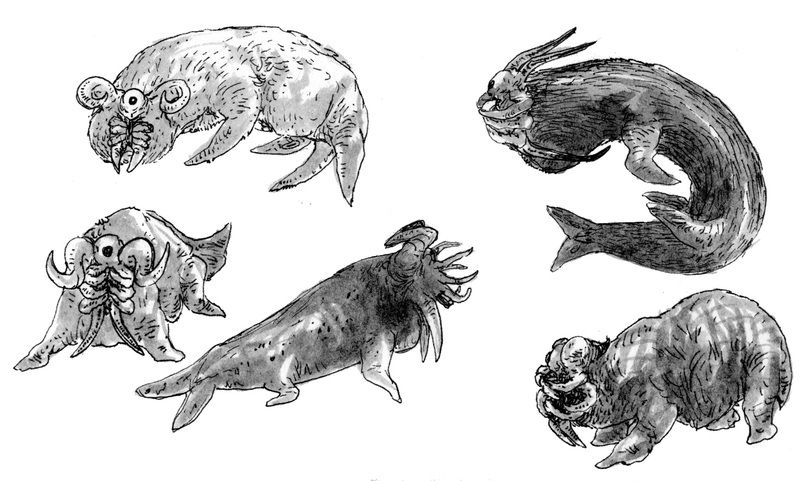 Asterops – Named for the starfish-like appearance of their face (or, perhaps, star-nosed mole), asteropsids are hairless, tentacled predators of the lakes, seas, and coasts. Many species take advantage of the concealment provided by buoyphyte colonies, ambushing prey from above or below the water’s encrusted surface. 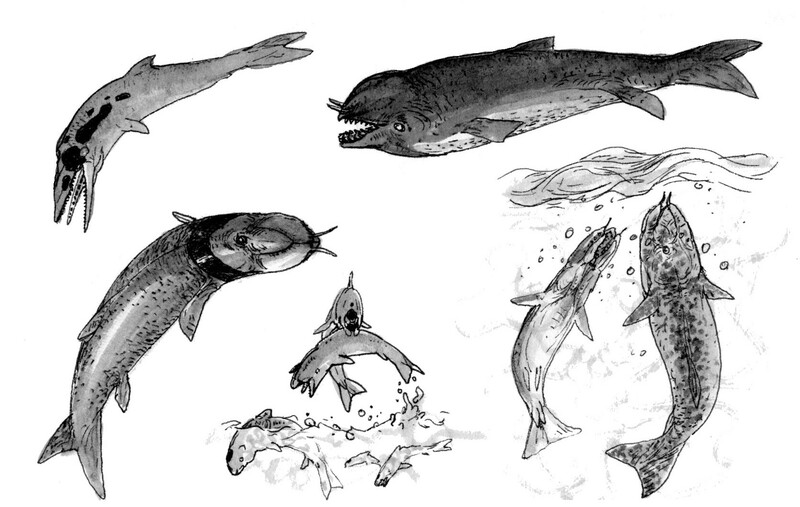 Whallabeasts – An early offshoot of asterops’ ancestor has taken to the sea, fusing several of its mouthparts into powerful jaws. The largest of these is capable of taking down zeppelins, the filter feeding giants of Ilion’s depths. Although their eye can only detect light and dark, two palps have developed into electrical sensors, similar to the tuning forks above. From here on, all clades belong to the subgroup Ankylodactyla, which are defined by fusion of the palp bones. This gives the mouthparts the appearance of fingers rather than tentacles. 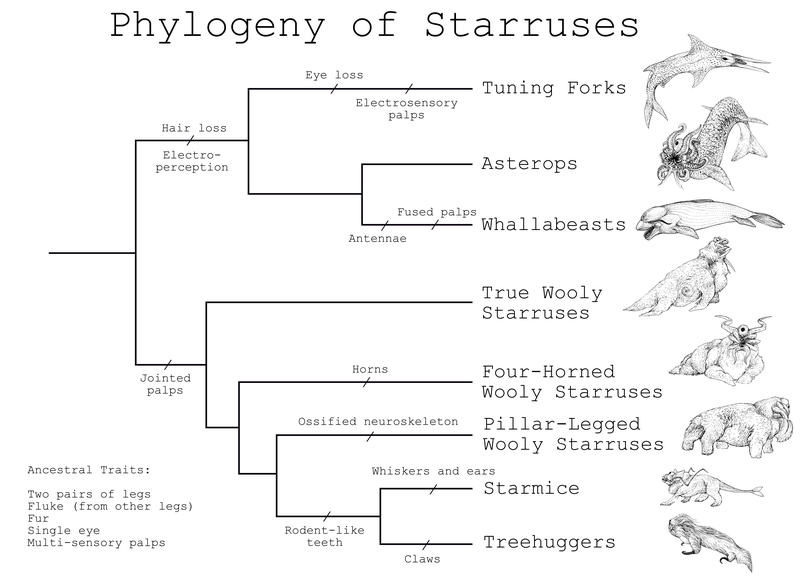 True wooly starruses – Wooly starruses are spread throughout the tree of Ankylodactyla and bear the closest resemblance to the group’s common ancestor. They are, however, paraphyletic so a basal group was named the “true” wooly starruses and the rest were given their own classification. True woolies can be identified by the characteristic cowlick on either side of the belly. Four-horned woolies – Males of these species bear horns reminiscent of Earthly hoofstock. The horns arose when the upper pair of tusks underwent additional fusion at the joints. The horns are used in defense, thermoregulation, display, and competition. Pillar-legged woolies – Ilian land animals are not known for their size, but members of this group can grow as large as a rhinoceros. Ossification of the neuroskeleton gave these animals the strongest bones on the planet, allowing their limbs to support a substantial weight. 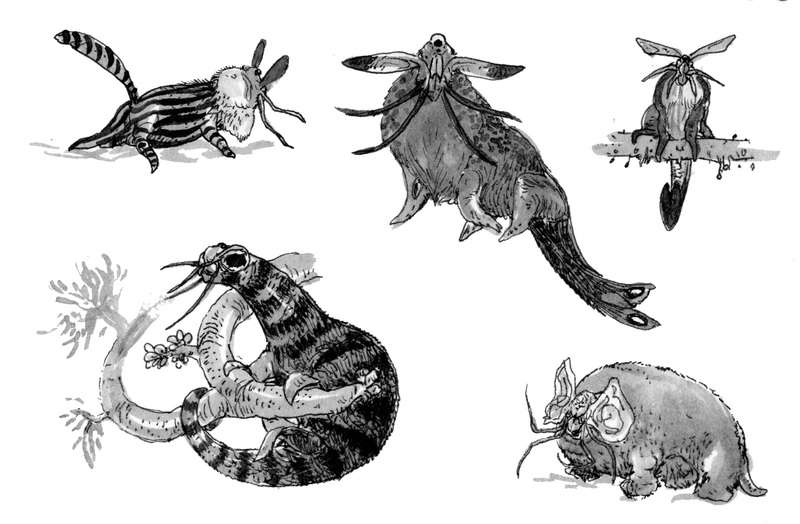 Starmice – Some resemble mice; others, rabbits. Innovations in sensory appendages give these animals the edge over their predators. The second-top pair of palps function solely as ears, while the center pair are whiskers. The second-bottom pair have been reduced to nubs used only in mating. Although lacking in depth perception, the eye is highly sensitive to motion, giving the animal a chance to escape before a predator gets the drop on it. 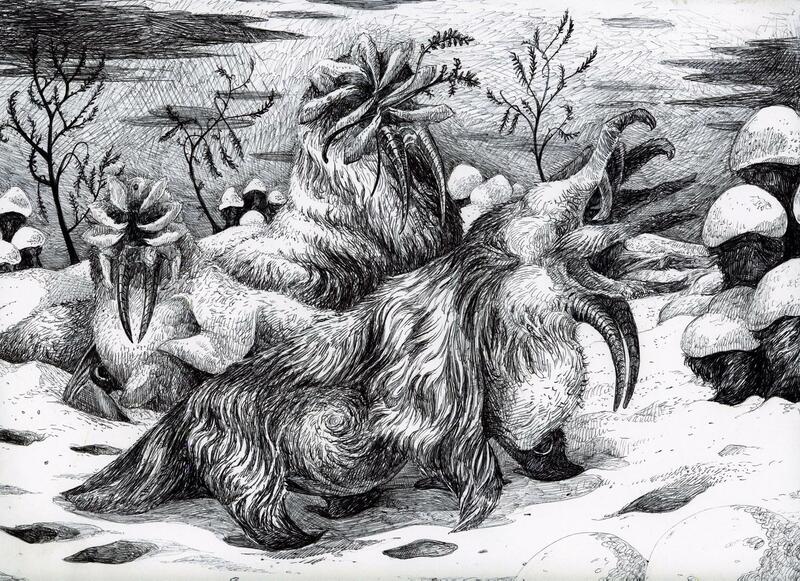 Treehuggers – four single-clawed feet led scientists to classify them as an ancestral form of starrus, which normally lack claws. But even a cursory look at the facial structure places this group firmly in Ankylodactyla. 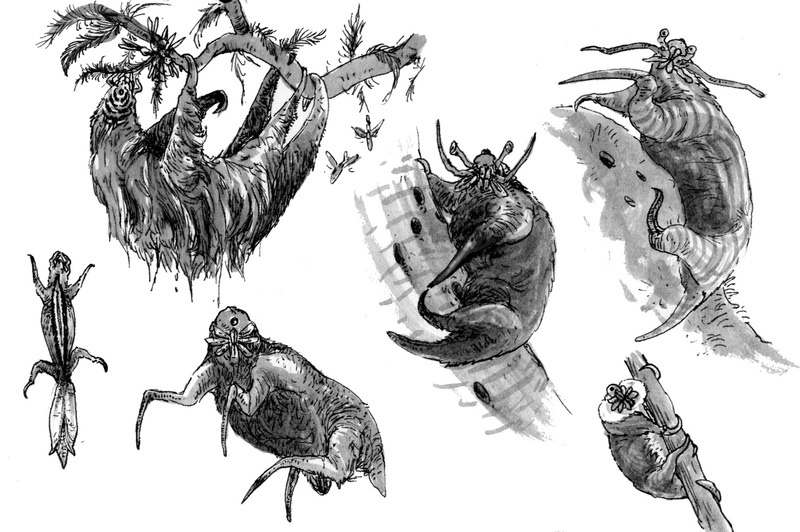 Treehuggers scamper up trees at speeds ranging from sloth to squirrel, cracking seedpods with rodent-like teeth. A single dorsal eye warns against monsters lurking in the upper branches. The claws are especially prominent in species from the rainforests of Aeneas and Pandaros, where those that lose grip will fall easy prey to the fog of war and devil’s archer, respectively. Knife-like claws help Deiphobus tropical species hack through the tangle of the redcap forest understory. Tuning forks have re-evolved poikilothermy. To conserve energy for the hunt, they lower their metabolism to a crawl while waiting in ambush. They can remain underwater for hours on one breath, only coming up for air after using their stunning weapon or giving chase. Parental investment is common in tuning forks. Their electrical sense is difficult to master and their method of hunting even more so, so parents will feed and protect their young into sexual maturity, and even beyond in some cases. Asteropsids have strong, flexible palps, giving their faces a cephalopod-like appearance, but the palps are not true tentacles. They are reinforced with a jointed, fibrous material made of modified nerve sheaths, the same material used in their skeletons. Each palp is lined with two rows of teeth for gripping and lacerating prey. A majority of asterops species are obligate carnivores. Some hunt in open waters, while others opt for an ambushing strategy in habitats thick with vegetation. There are no species known to hunt on land. Two female star walruses. The individual on the right is pregnant. On the other, scarring from her last pregnancy can be seen. Star walrus – This asteropsid was the first large animal encountered on Ilion. 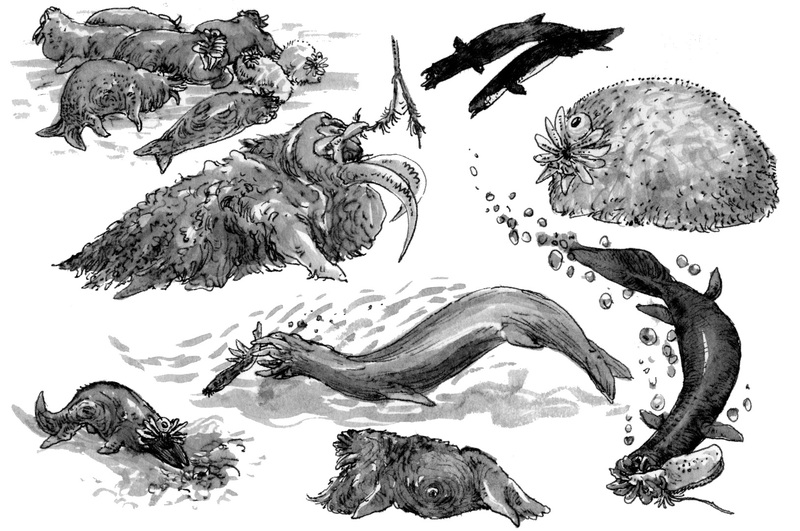 Its appearance won it the name “star walrus” because, according to its discoverer, it looked “like a star-nosed mole got busy with a walrus.” The name didn’t stick for the group as a whole, but the contracted form “starrus” did. A reconstruction of a male star walrus based on photos, videos, and reports from Odyssey I. Note the curved tusks, which are short and straight in the female. Convergent evolution has led to a near repeat of Earth’s cetaceans on Ilion. That’s not to say all whallabeasts are whale or dolphin analogs, however, or vice versa. The niche of giant suspension feeder is occupied by the zeppelins, the great colonial volcanoids of the open sea. All whallabeasts are active predators. 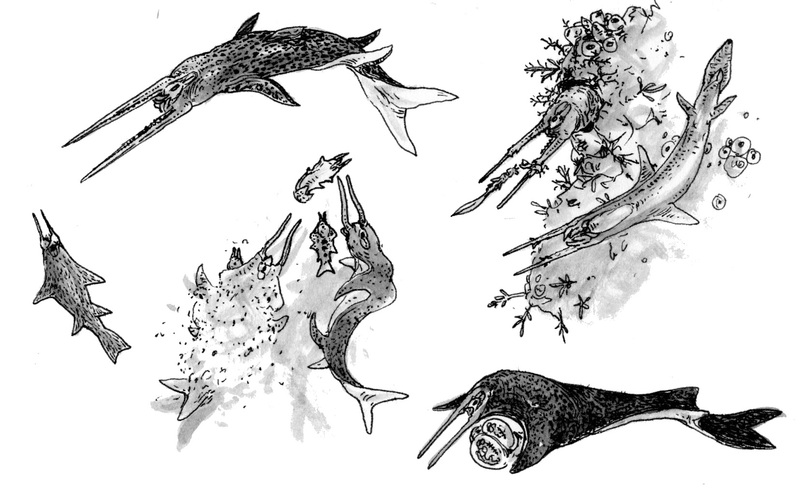 Some hunt in pods, while others are solitary, behaving more like sharks than whales. Due to their poor eyesight, they depend on hearing, echolocation, and their electrical sense to navigate and track prey. Gulf whallabeast this is just one of many whale-like predatory starruses in the open ocean. While most pick on animals smaller than themselves, the gulf whallabeast goes after zeppelins, the giant filter feeders of Ilion’s oceans, on its way to the breeding grounds on the terminator. The female cannot swim fast enough to hunt for herself, as she is burdened by a heavily modified pair of tusks that extends over the reproductive organs to protect her two developing young. An entourage of suitors cares for her every need. Each sticks around hoping that at least one of the twins is of his seed, but he will not find out until the female releases the calves into the open water. If he was unsuccessful, he is faced with a choice. Should he hope for better luck next time, or try his luck with a new mate? Should he join the bachelor pod that is heading out now, or wait for the new calf to grow up and join her in exile? Semiaquatic woolies are typically shaggy, omnivorous ice-dwellers, but some bald species inhabit the temperate coasts. Otter-shaped true wooly starruses are found in mountain rivers and cold coastal regions that lack competing asteropsids. O’Hearn’s wooly starrus – the first species to receive the label “wooly starrus” (a group which turned out to be paraphyletic) was named after its discoverer. O’Hearn’s wooly starrus is ubiquitous across the coasts and ice shelves of Polyxena and Deiphobus. Populations migrate freely between regions to cope with the rapid climate flux characteristic to Ilion’s east terminator. They are omnivorous but the bulk of their diet consists of black plants and their seeds. O’Hearn’s wooly starrus nests communally. A male Anticlus wooly starrus watches over his harem at Big Sun Glacier near the north terminator. His booming call carries far and wide. Pillar-legged starruses are larger than their cousins and tend toward a more terrestrial lifestyle. Although they don’t get as big as Earth’s largest mammals, their great size and strength protects them from most of Ilion’s predators. The second pair of tusks, derived from the upper palps, serves different purposes in different species. The most common use is male competition for mates; in these species, females have reduced horns. They perform other functions as well, including protection, icebreaking, and thermoregulation. Treehuggers are unique among starruses in that they possess claws. The claws have many uses, including defense, climbing, brachiating, and food acquisition. The animals in the middle and upper right use a specialized arm to bore holes in trees to get access to grubs, lancers, and archers that parasitize the plants. 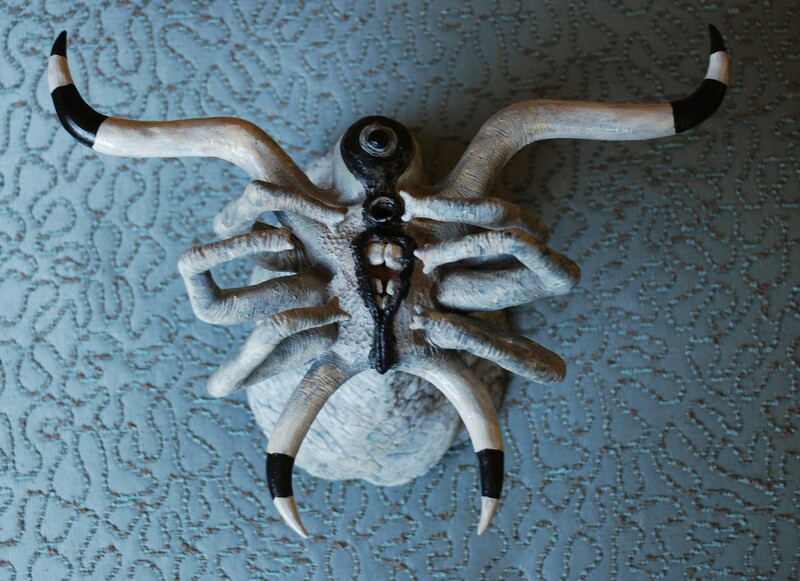 Their palps are also specialized for their diet. The second pair ends in a stethoscope-like structure that can detect the movement of worms with great precision. The third pair is long and dextrous, perfect for plucking their prey out of the holes. Starmice are known for their sophisticated sensory structures, prominent tails, and rodent-like teeth. They can be distinguished from treehuggers by their large ears and lack of claws. 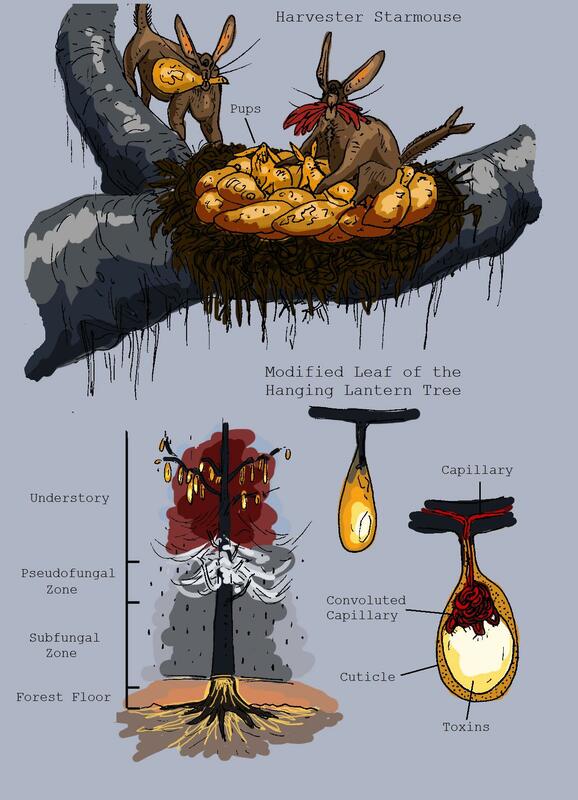 Lamp trees play a crucial role in the Aenean rainforest ecosystem. This family of black plants is one of the few that can survive the harsh chemical conditions of the forest floor, and their presence allows other plants to flourish nearby. Waste from the pseudofungus collects in pools of water, where it is consumed by a variety of microbes. Byproducts of pseudofungal and microbial activity are toxic in high concentrations. The system only remains stable over long periods of time because lamp trees continually filter out the metabolites and sequester them in modified leaves. Specialized microphylls have evolved into bulbous, luminescent structures that hang off of lower branches above the pseudofungal zone. They can become a burden if they number too many, and those that fall off will leach their contents back into the water that the tree worked so hard to cleanse. One species, the hanging lantern tree, has developed a unique association with a species of murioid starrus to help discard the poison leaves. The harvester starmouse collects the leaves to line its nest. Because the pups are the same color as the toxic leaves, predators leave them alone. The risk of fatal poisoning is too great. After some time, the leaves lose their vibrancy and the pups stand out against the drab background. Because of this, starmice have an incentive to collect fresh leaves until their pups are old enough to fend for themselves. By this time, the worst of the chemicals have broken down and the leaves fall harmlessly to the ground. Why the traffic jam all of a sudden?